Even though it IS possible to achieve a flat belly and defined abdominals for most people, they’re usually going about it the wrong way. Hopefully you know by now that abs are really created in the kitchen. In other words, 75% of achieving a lean, toned midsection is due to properly applied nutritional fat burning tactics. Once you’ve lowered your body fat enough to visually see your ab and stomach muscles, the next move is proper development. 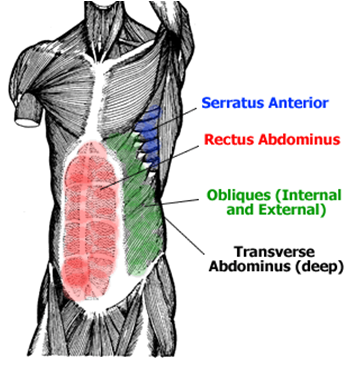 Most people don’t even understand what the ab muscles really are…AND they’re not even training them properly, much less following a complete approach. What is a complete approach? A routine that addresses all 4 key regions of your abs. The majority of the population is typically not even aware of the fact that they need to do exercises for all 4 areas of your abdominals. They often focus primarily on only the upper region of the abs and then wonder why they’re not getting results. The 4th area – our core, is compromised of the entire ab region. Although “core” training is very trendy, a well-balanced exercise approach using lots of free weights will automatically develop a very strong core. Just remember that your core is the region that lies between your torso and waist. Now that you understand the 4 TARGET areas you should be working to flatten your stomach, we’ll be back in a few days with crunch-less exercise demonstrations to help you say good-bye to boring traditional ab routines. This is the type of ab training will help you maximize your genetic potential once your body fat is low enough.